APRIL 24, 2019- The Tentative Agreement regarding a new collective bargaining agreement has passed. The vote tally was 275 YES and 31 NO with 306 votes cast. The contract will run from 07/01/16 thru 06/30/21. February 13, 2019- Congratulations to Lonnie Blackwell on his promotion to Captain. JANUARY 12, 2018- The results of the vote on the Contract Tentative Agreement are as follows : 133 yes 152 no. Contract DID NOT pass. DECEMBER 08, 2017- Congratulations to Raymond Masek on his promotion to Captain . FEBRUARY 16, 2016- Congratulations to Kevin Gilleran on his promotion to Captain. DECEMBER 05, 2016- Local 1159 would like to congratulate Elizabeth Santora, Adam Roscoe, Timothy Leonard and Juan Serrano on their promotions to detective. SEPTEMBER 03, 2016- Congratulations to Donald Bensey, Fabio Pereira, Jeffrey Long, Frank Cuccaro and Jessis Pizarro on their promotions to Sergeant. FEBRUARY 11, 2016- Congratulations to Charles Johnson and Robert Magnuson on their promotion to Lieutenant. JANUARY 14, 2016- Congratulations to those promoted. Promoted to Captain- Brian Fitzgerald, Mark Straubel, Steven Lougal and Rebeca Garcia. Lieutenant- John Gale, Thomas Minar, Nancy O'Donnell and Vincent Ingrassia. Sergeant- John Burke, Christine Burns, Joaquim DeBarros and James Ivanko. Detective- Jeremy Kelly, Everton Walker, Albert Palatiello, Theodore Montagna, Kenneth Fortes and Barbera Gonzalez. SEPTEMBER 29, 2015- Congratulations to Michael Cantrell, Frank Delbouno, Thomas Harper and Jeffrey Holtz on their promotions to detective. Bridgeport Police Union Local 1159 is accepting documentation for its Scholarship Drive for the members of Local 1159 ( Children ). Anyone whose child has graduated this year of 2015 from High School and is continuing their education at an accredited College is eligible for a scholarship award. The Union sponsors a annual Golf Tournament ( Gerald DiJoseph ) to help keep this Scholarship drive funded for our members. All members are encourage to help, especially the members who child is receiving the Scholarship award, by either participating. In the Golfing event as a Golfer, volunteering or buying some Dinner tickets ( $65.00 ). Most importantly the GOLF TOURAMENT is on September 28th 2015 and is being held at FAIRCHILD WHEELER. Bernard M Webb V. P.
JUNE 26,2015- Retro payment along with the 7.5% will be in the June 26, 2015 check, in addition the last raise of 2.5% will be paid on July 17, 2015.
healthcare and working conditions; this is just a reflection of what we will fight you in the future. The Contract is ratified. President Chuck Paris and the E-Board would like to thank the entire membership for the great turnout! September 4, 2014-Congratulations to all promoted. Promoted to lieutenant were: Brian Dickerson and Jeffrey Grice. Promoted to sergeant were: Stacey Lyons, Trevor Niestemski, Frank Jacobellis, William Simpson, Scott Waehler, Paul Scillia, Ivan Delgado, Lawrence Lazaro Jr., Eric Schneider, Bernard Webb, Jonathan Duharte, Adam Rozum, Christopher Robinson and Gabor Meszaros. AUGUST 25, 2014- The final results for the election of the executive board two open positions are, officer Michael Carter 80 votes and officer James Ivanko 61 votes. April 28, 2014- Congratulations to Ron Mercado on his promotion to Lieutenant. February 10, 2014- Congratulations to Manny Cotto and Paul Grech on their promotions to Lieutenant. 12/22/11- Congratulations to James Baraja on his promotion to Deputy Chief. 11/16/11-Congratulations to Tom Scholl, Wilfredo Nieves, Vincent Larriccia, Larry Lazaro, Jessie Pizarro and Greg Iamartino on their promotions to detective. October 10, 2011- The results of the recent Union Executive Board Election were announced at the monthly meeting. Congratulations to those promoted on 09/22//11- Sergeant-Mark Belinkie. Detective-Sean Ronan, Edward Martocchio, Kenneth McKenna, Artur Calvao, Jason Ferri and Ramon Garcia. MORE RECENT PROMOTIONS- Rich Azzarito to Lieutenant, Milton Johnson to Sergeant and James Kennedy to Detective. Congratulations to those members recently promoted to the rank of Sergeant- Jason Amato, Michaeal Burdo, Angelo Collazo, Louis Cortello, Sue Cortello, Mathew Cosgrove, Pasquale Feola, John Gale, James Geremia, Jeffrey Grice, Edward Golding, John Klesyk, Joseph Morales, Ronald Mercado, James Myers, Nancy O'donnell, Edward Rivera, Bradford Seeley. Philip Sharpe and Luigi Tucciarone. Congratulations to Ray Masek on his recent promotion to LT.
Congratulations to those promoted on 11/16/09. Promoted to Assistant Chief- Lynn Kerwin. To Captain- Joseph Savino Jr., Armando Perez, Robert Evans and Aida Remele. To Lieutenant- Brett Hyman, John Cueto, Kevin Gilleran and William Bailey. 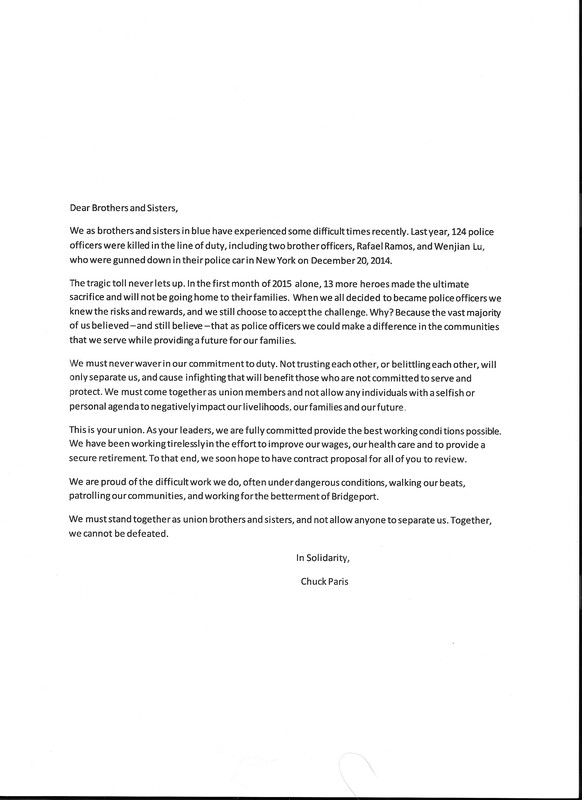 To Detective- David Garcia, Joseph Badolato, Martin Heanue, Todd Hoben, Mark Graham, James Borrico, John Burke, William Reilly, Mark Belinkie and Jorge Cintron. UNION EXECUTIVE BOARD ELECTIONS- The final results are in. Those positions that do not require a runoff are Secretary (Rich Mercado) and the 6 positions on the Executive Board. The 6 executive board members are as follows: John Whalen, Ed Perez, Ricky Lopez, Danny Gomez, Chris Borona and Brian Pisanelli. All members should see a member of the E-board for copies of the updated collective bargaining agreement. Employee Assistance Program (EAP)-1-800-864-2742. 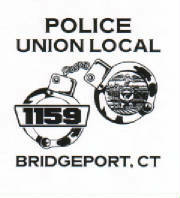 EAP is for all members of the Bridgeport Police Department and their family members. Or you can visit Behavioral Health Consultants Employee Assistance Program by clicking below. UNION CONTRACT: The 2012-2016 collective bargaining agreement is available online . The previous 2004-2008 and 2008-2012 agreements are also available.